I don't know about you, but I really struggle this time of year to find good light, and if there is good light then chances are it's pretty chilly or wet outside (and I'm not a cold weather person at all). Plus working from home normally means jeans, jumpers and slippers - not the most exciting outfit! All of which adds up to not many outfit posts this time of year. But recently, I was lucky enough to win an Evans gift voucher while at the Curve Fashion Festival, so after a lovely day in the Newbury store, I decided to brave the elements (and give the postman a good laugh while he was doing his rounds). First up, a couple of tops that I just wasn't sure about. 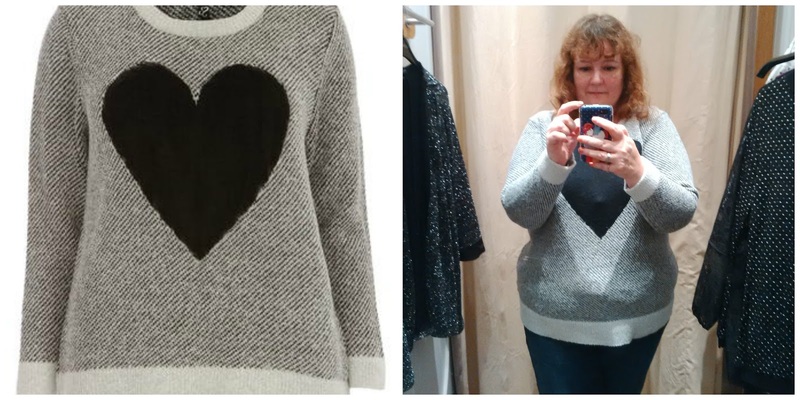 I really did like this heart print, but how many heart prints do I need (no answer needed). 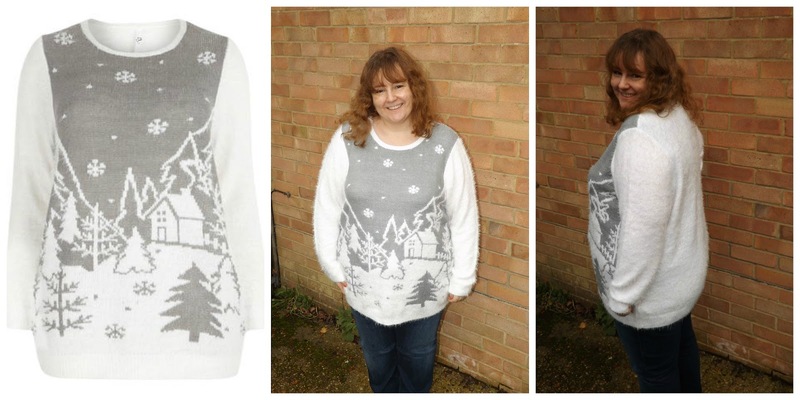 Plus I love my jumpers baggy and cosy so I would want to size up in this (this is a 22/24). I'm still thinking about this, it may end up in my wardrobe yet. Now for the items I fell in love with. 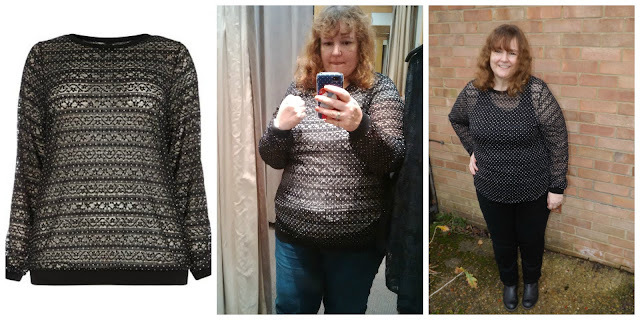 Please excuse some of the wobbly changing room shots and my serious concentrating face! This was in the sale - a bargain at £12 (size 20). It's sheer lace with ribbed cuffs and hem details. I had a white t-shirt on in the store, but normally I'd wear something like a black vest underneath. 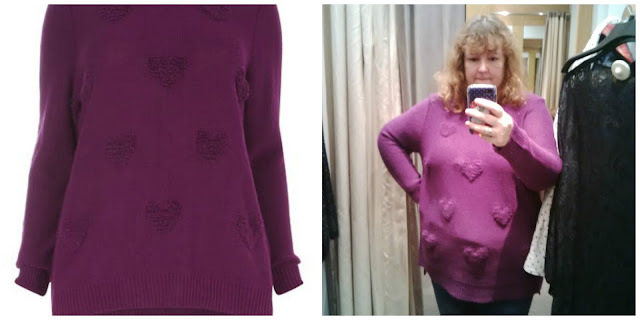 Now these last two jumpers are a perfect example of some of the confusion I felt with the sizing. 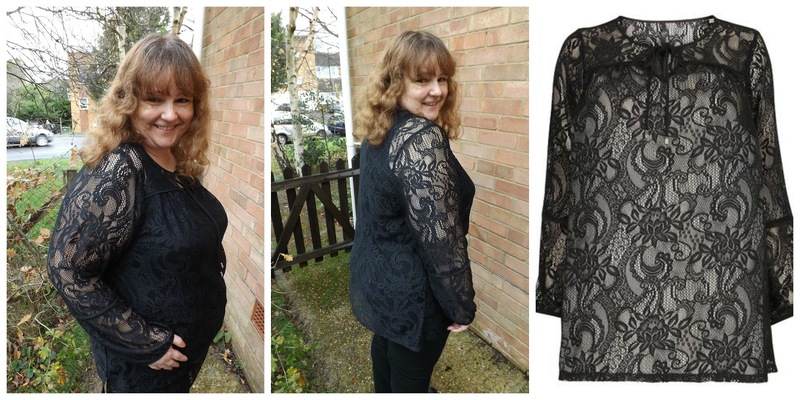 I know that there is no standard size, despite what the industry would like us to believe. I have clothes in my wardrobe ranging from a 16 to a 22. I tried the 22/24 on in jumpers as I like a loose fit and I expected the 22/24 to give me that, but this white scenic jumper I had to size up to a 26/28. Now this is my personal choice and others may prefer a more fitted style, but it's worth remembering if you're ordering online. And you know what - it doesn't matter. It's only a label. 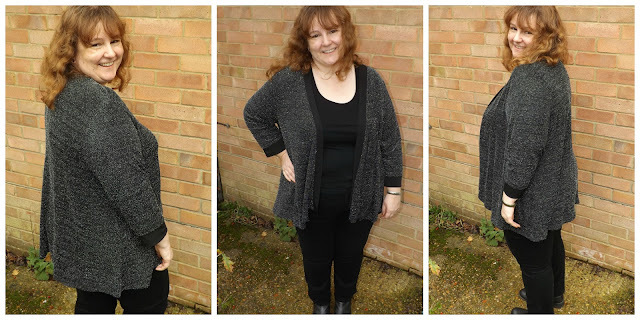 Size 26/28 - it's so fluffy, I feel like a cuddly polar bear! Finally, a real frivolous purchase (you got to have one of those sometimes). I'm not sure when I'll wear it, I can certainly think of lots of occasions in the past when I could have worn it! But it will keep and I fell in love it with it, so it just had to come home with me. 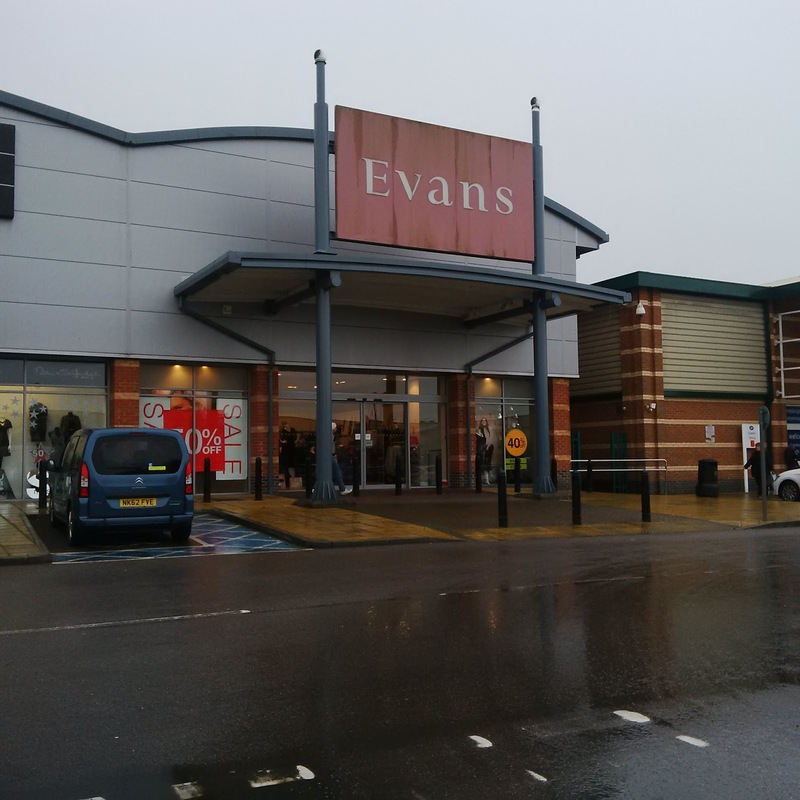 The Newbury store may not be the largest of the Evans stores, but the ladies there were so friendly and helpful. I was in there for so long, I'm sure they thought I was moving in! I didn't manage to get any Scarlett & Jo, so a trip up to London is called for very soon I think to spend the rest of my voucher. 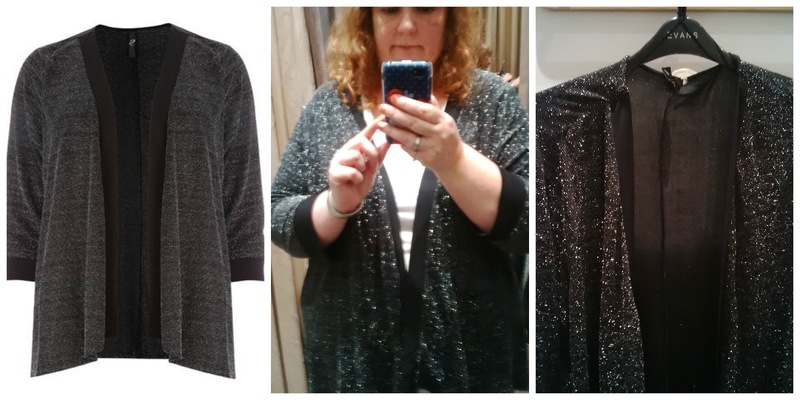 That sparkly cardi is gorgeous! 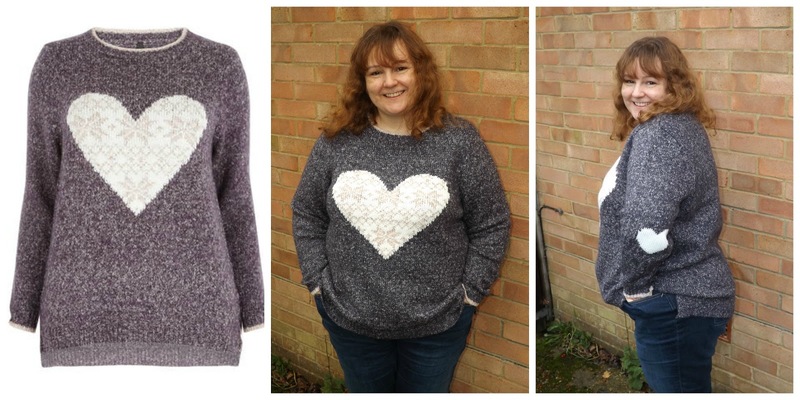 I am so glad you got it as it really suits you - love the little pink one with the hearts too!